This weekend was somewhat a productive one. The house isn’t clean, and the laundry isn’t done, but I finished a project! Okay, it’s not the shawl, but I think it’s very cute. 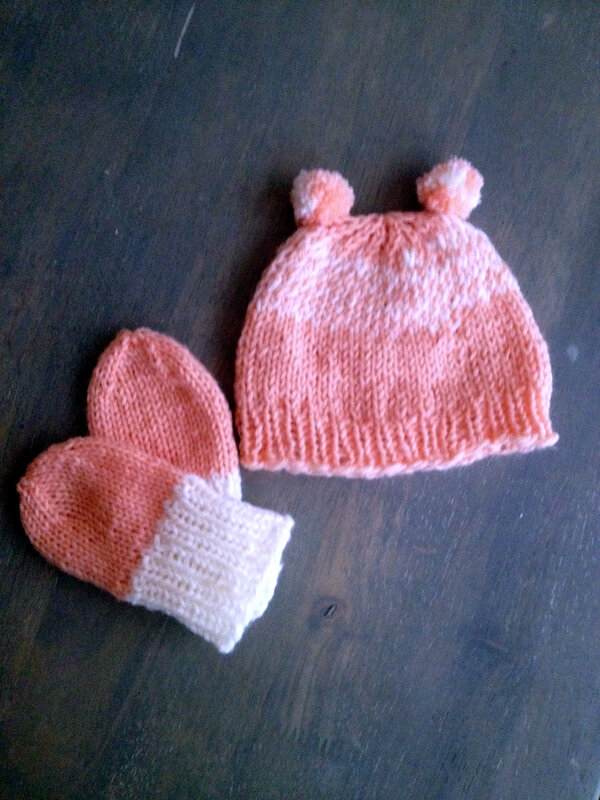 The project was a winter baby set, with mittens and a hat. Last week, a friend of mine told me her daughter was expecting a baby girl. She asked if I had any baby girl items lying around. I did think about the red baby mittens I made before, but I kind of wanted to making something special for her as she is just one of those amazing people you don’t come across every day (unless you work in the same building like we do). The yarn for both projects is Baby Bee’s Sweet Delight Baby from Hobby Lobby. The hat is the Flurries Newborn Hat by Jenny of Wiseknits. It is one of the cutest hats, and the pattern is very easy to follow. Because my friend and I had talked about loving teddy bear hats, I added pompoms to resemble teddy ears. I think the pompoms just really made the hat. The mittens are the Basic Baby Mittens by Kali A. Salvatore. These were also very easy to do. Because this baby will be very little in the winter (and we don’t have much winter here in Texas), I opted for slightly shorter hands on the mittens and cut the length by about 0.25-0.5 of an inch. I think they turned out absolutely darling. The pattern was very well written and so easy to use. The whole project, from hat to mittens, took about 6 hours. I finished the hat on Saturday and then picked the mittens up on Sunday. It was actually quite refreshing to work on a smaller project and take a break from the shawl, which is inching along at this point. As I’ve just found out about a couple of more new babies on the way in family and among friends, I may have a couple more opportunities to make some small projects.